Enjoy the sights and sounds of Music City on our one hour guided tour via open-air, custom golf carts. This tour features informative commentary on the deep roots of music row, Nashville history, visitor attractions and of course our very own Broadway known as Honky Tonk Highway. Start checking things off your bucket list with us as soon as you arrive in town. The maximum group size of this activity is 7 people. Arrange a pick up at your hotel or meet downtown at 100 1st Ave S which is near Riverfront Station to get your Music City sightseeing tour started. Once you hop on, your certified and knowledgeable tour guide will discuss your Music City bucket list of must see and do locations with you. 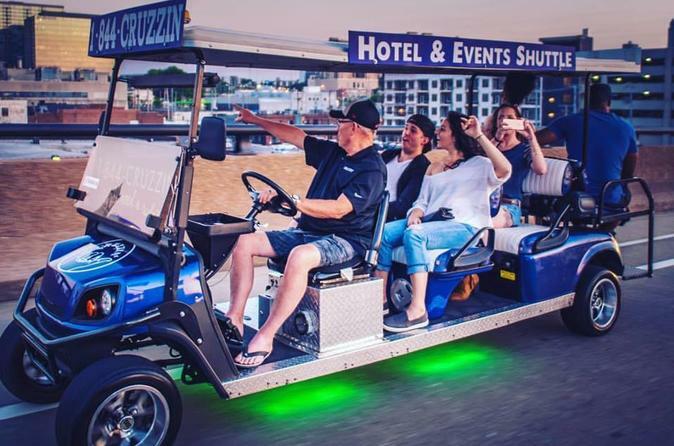 As you travel on an open-air cart, you are welcome to sync your own music, kick back and enjoy the sights and sounds of Nashville. Nashville is unlike any other city since it creates its own ambiance. You will enjoy the locals perspective of Nashville, while learning all kinds of trivia and fun facts. Don't forget your camera, you will be presented with multiple beautiful photo-ops and you never know who you may see! Once the fun has come to an end put your Nashville knowledge to good use and get out there and enjoy this beautiful city. Allow your guide to show you the heart of Downtown and what makes Nashville come alive.